Picture: Marcus Christensen, Linda Sygna, Karen O´Brien and Eva Grothe (from left). Photographer: Birthe M. Selvaag. 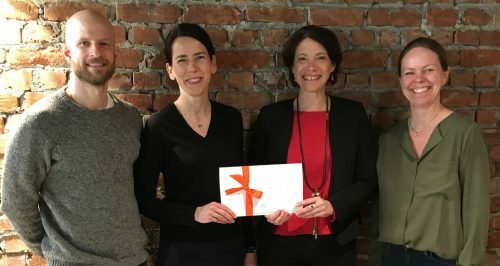 We are honoured to receive a financial gift from the Savings Bank Foundation DNB, an independent foundation that contributes to subjects beneficial for the public. We will use this funding to continue to develop our work with children and youth, with an emphasis on their role in transformations towards sustainability. By providing knowledge, inspiration and tools for experimenting with change, this project aims to empower youth to actively engage with (and as!) solutions to climate change. The project consists of a learning program and a platform for sharing information, experiences and reflections. At the core of this is the cCHALLENGE, a 30-day experiment with change. Participants taking this challenge choose to make one change related to their context, the environment and opportunities found nearby. They will be organized in groups, in order to create a sense of community. Examples of potential challenges include taking care of a plant, redesigning clothes, making vegetarian dishes for the family, or spending one hour outside every day to experience nature. Throughout the experiment the youth will be informed and guided by a tailored program consisting of inspirational facts, videos, and questions for reflection. Experiences and insights will shared on a digital platform through short blogs, photos and news stories. We look forward to offering cCHALLENGE to children and youth both in Norway and internationally, encouraging them to be part of the climate solutions in a fun and creative way. We would like to give a big thank you to the Savings Bank Foundation DNB for making this possible!